We took them to Disneyland. Surprised them in the airport and flew to California. We left the baby with the Oma. It was great, but if I had to guess, their favorite experience of the summer may have been this afternoon. It may have cost $2. It may have been in the form of two cans of barbasol. 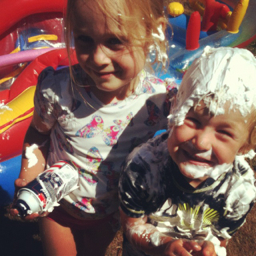 These two would like to include "end of the summer shaving cream fight" to our growing list of family traditions. Looks to me big Sister won that contest!! Big fun.